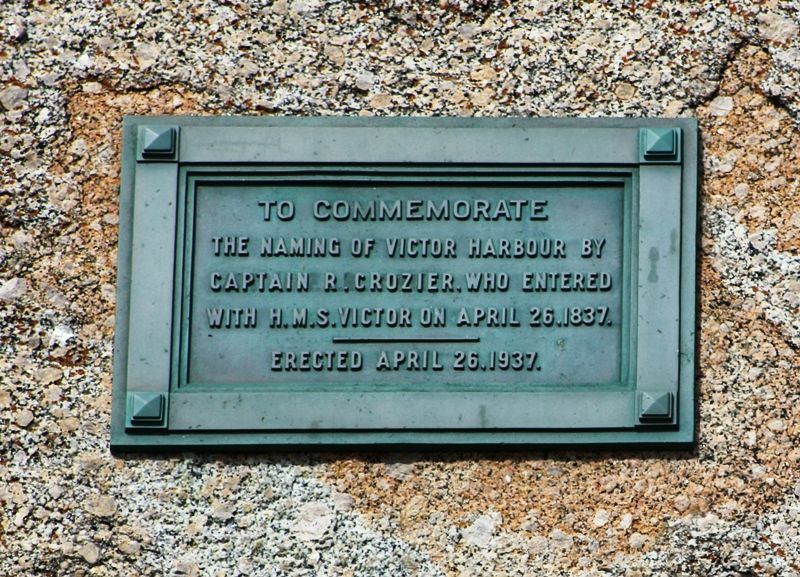 A plaue commemorates the naming of Victor Harbour by Captain Richard Crozier in April 1837. Captain Richard Crozier, anchored in the lee of Granite Island at 5.30 p.m. on 26 April 1837, on his way back to Sydney and India. He named the place 'Victor Harbour' (note his original spelling) after his ship HMS Victor, and the Bluff 'Cape Victor.' He also noted the names given by the whalers to the islands - Granite, Wright's and Seal Rock. In the 1860s when port facilities were established, the name 'Port Victor' came into use. There was ongoing confusion with Port Victoria on the west coast. Later that year the State government gazetted all South Australian harbours with the spelling 'harbor' - including official reversion of the name to Victor Harbor. Dr. Grenfell Price has consented to unveil a brass tablet at Granite Island on Anzac Day, April 26, (sic) to commemorate the 100th anniversary of the sailing into Victor Harbor of Crozier's vessel, H.M.S. Victor. The town was named after this vessel. Dr. Price is chairman of the South Australian branch of the Royal Geographical Society and the tablet is to be affixed to a huge granite boulder at the end of the breakwater near the island kiosk and at the foot of the ramp leading round Granite Island. News (Adelaide). 10 April 1937. To commemorate the naming of Victor Harbour by Captain. R. Crozier, who entered with H.M.S. Victor on April 26, 1837.